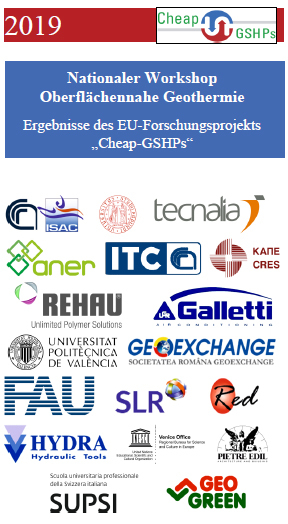 During the one day workshop on Shallow Geothermal Energy, the results of the “Cheap-GSHPs” Project will be presented. Experts from various fields will have the opportunity to share their experience in the reduction of the shallow geothermal systems installation costs. Participation is free of charge and is aimed at planning and installation companies, drilling companies, public sector lawyers, end-users, students and other stakeholders. Applications must be sent by email to Johannes Müller (johannes.j.mueller@fau.de) no later than 31.01.2019 . Further information can be found in the Workshop Flyer!